In summer 2001, just arrived in Berlin, Zora Lanson becomes the godmother and host of an illegal club. The events take place in olian's huge appartment, on the 4th floor of an otherwhise empty house next to Alexanderplatz. Soon, each night this "Monday-Bar" is completly packed. Music lovers, night people and all kinds of creative freaks appreciate the combination of intimate atmosphere and free entry. There is a bar with sofas and weird bartenders. In the room is the dancefloor with a panoramic view on the TV-Tower. This set-up is ideal for Zoras and olians passion – the choice of finest musical programmation. Foto-Shop, Blumenladen, HAU2 (ex-Theateram Halleschen Ufer). 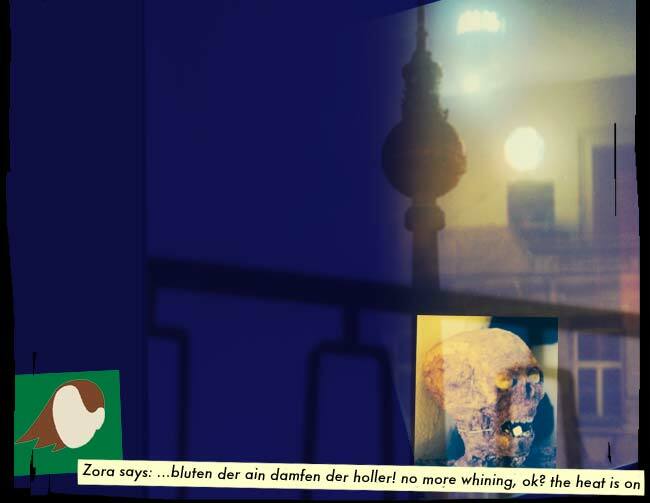 Zora Lanson’s events were a household name in Berlins club life, always on the edge between underground and experimental entertainment.